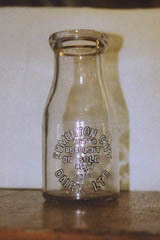 Milk bottles, the first obvious dairy collectible, first appeared in Western Canada about 1905 or so. Prior to that milk was dispensed by dipper into the customer's container. The development of the automatic bottle manufacturing machine made good bottles of consistent quality available at reasonable cost. 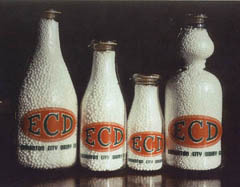 These bottles were designed to be sealed with paper caps, which have also become collectibles. In eastern Canada, other styles of bottles were in use earlier. These included bottles with a hinged sealing device known as a lighting closure. To my knowledge they were not used in the west. Many dairies operated in each of the four western provinces and collecting the milk bottles of each province is a challenge. Many smaller dairies used only plain bottles, perhaps differentiating their product with their own printed caps. In Alberta for example, I am aware of 80 dairies who used milk bottles with their names on them. Of those, some of the earlier larger ones in Edmonton were Edmonton City Dairy (1906), Warren Huff, later Jasper Dairy (1907) and Woodland Dairy (1908). In the west usually only three sizes of bottle were used: quart, pint and half- pint. A few dairies in the Vancouver area (Assodated Dairies, Spencer Dairies, Steve's) used one-quarter pint bottles. 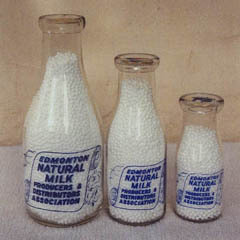 The cream-top bottle was used by Edmonton City Dairy, Purity Dairy (Saskatchewan), Palm Dairies, and City Dairy (Winnipeg). The earliest bottle style used was the empire or bowling pin shape. These were followed by the stubby bottles before manufacturers and dairies standardized on the common round bottle, taller and with longer necks than the stubbies. Dairies first used this later style with embossed labels and later with many colorful varieties of applied colour labels. By the 1950's, some dairies moved to square bottles with the same wide mouth as the round bottles and then lastly to the light weight square bottle with a narrow mouth. Collecting milk bottles offers many challenges and collectors may opt to narrow the scope of their search to one province, or coloured label bottles only, or for space-saving purposes, to one of the smaller sizes. Some dairies apparently placed numerous orders for smaller quantities of a variety of embossed bottles. Crescent Creamery of Winnipeg used a very interesting array of bottle varieties, all embossed. So far I have acquired and identified 22 varieties. Palm Dairies, a larger, multi-branch operation used many varieties of embossed and ACL bottles. Edmonton City Dairy used 29 different groups of bottles, not counting the different slogans on the round two-colour label bottles. 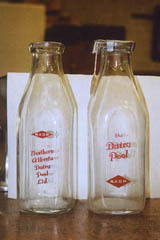 Contrasting with the larger dairy operations, were the smaller dairies which used only one style of embossed or applied colour label bottles. Hamilton Dairy of Hanna, Alberta, used only embossed bottles, which I have seen in the quart and pint sizes. Whitehills Jersey Dairy of Red Deer used only green coloured label bottles (quart, pint and Vi pint sizes) all with only one slogan; "Our milk builds great athletes." Some may have used only bottles of one size, since that is all that has surfaced in some cases. For Wichman's Dairy of Stony Plain, Alberta, I have seen only a yellow coloured label quart, while for North Edmonton Dairy I have seen only an embossed quart. However in the field of antique collecting, one always has to be ready for another surprise at the next shop in the next town! The advent of the applied colour labels allowed the dairies to expand greatly the styles of logos used, as well as the advertising slogans on the reverse. While the Edmonton City Dairy used only four advertising slogans, Palm Dairies and Kootenay Valley Co-op Dairy of Nelson, B.C. used up to two dozen different slogans. All of Palm's were product advertising slogans. Most of Kootenay Valley's were nursery rhymes such as Little Boy Blue, Little Jack Horner, Peter Pumpkin Eater. 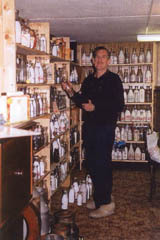 The author, Bob Snyder, with part of his milk bottle collection. Milk bottle tops (the paper caps) are also fun to collect and easier to store and display. They range widely in rarity. Tops from some of the larger dairies are common, while those from some of the smaller dairies (e.g. Rife"s or Henry's Dairies of Edmonton) are rare. The same applies to dairy tokens. Some, Brown's Dairy and City Dairy, both of Drumheller, Falhler Dairy and High River Dairy are rare. 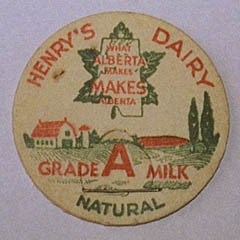 Others such as Palm Dairies, and Alpha Milk and Alpha Jersey Dairy of Calgary are very common. Prior to tokens, paper milk tickets were used by some dairies. These are very scarce. In the case of tokens, books have been published for each western province listing merchants and other tokens, including those issued by the dairies. Such books provide some structure to token collecting by defining the scope of what is out there. Such is not the case with most other dairy collectibles. Cream cans in the smaller sizes (one gallon, two gallon and three gallon) are nice collectibles. Many in these sizes have dairy names stamped on them. In my collection I have several dozen from the four western provinces. Milk crates and butter and cheese boxes are also collectible and come in many sizes, shapes and types. I display a lot of them, using them as bases or supports for other displayed items. There are a wide variety of "go-with's" that provide variety and added interest to the dairy collector. These include: milk top picks, cook books, needle kits, school rulers, ice cream serving trays, and dairy anniversary booklets. Dairy signage is also highly collectible, as are dairy ice cream clocks. Signs I have seen include older trolley advertising cards from about 1928. Of assistance from the research standpoint, are dairy calendars. As well as helping to date the time of a dairy's operation, they often provide address details and the proprietor's name. Old business records, letters, invoices and price lists are also of great interest to the collector. Out of my collecting activities, has grown a strong interest in the history of the dairies. So far this has led me to publish two books; The Milk Bottles of Edmonton City Dairy (Second edition 2004) and Dairies of Edmonton. The first provides information about the Edmonton City Dairy, details and photos of the bottles used by the dairy and information and photos of the myriad of promotional items, and other business items they used. Dairies of Edmonton provides a listing of the 134 dairies that operated in Edmonton from 1905 to 1955, with photos and individual histories including descriptions and photos of artifacts.